News Report: Mr and Mrs Stanley McBride are so proud of their daughter Mary (pictured). 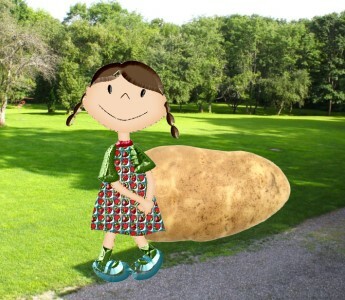 She had just come fifth in a Grow the Biggest Potato competition at her school. Letter to Editor I: I am shocked and horrified that the parents of the "girl" who got fifth in the potato growing competition have already determined the gender of their child. She is only nine, for goodness sake, and already she is having her parents’ old-fashioned definitions of sexuality rammed down her throat. Who said the child wants to be a girl? Who determined at such a young age that she should be female? While I congratulate the child on getting fifth with its potato I am sure the child shall come somewhere near the bottom when it comes to coming to terms with its own sexuality. Letter to Editor II: How dare the school run a competition. A competition exists to make those who do not win feel bad about themselves. The school could have had instead a Celebrate the Potato Week. But no! They have to go and tell most of the students that they are losers. Even the little girl who got fifth is a loser. There can be only one winner in a competition and that is the person who gets first. The girl is a big-time loser and that is all this potato competition is telling her. Letter to Editor III: Why did we see a photograph of the girl who got fifth in the potato growing competition? Was it because she was a girl? I would like to have seen pictures of the boys’ potatoes. A couple of the boys holding onto their potatoes would’ve been much more stimulating than seeing a girl holding a spud and getting fifth. What is the world coming to? Letter to Editor IV: I would like to join with others in congratulating the little girl who got fifth in the potato growing competition reported in your paper last Thursday. The photograph of her is stunning, and she looks wonderful in her summery frock purchased, I believe, from my shop on Duke Street. I am putting this brand of children’s wear at half price during this week as a way of celebrating. But be in quick. They will sell fast – Like a hot potato! Letter to Editor V: I hope the girl’s potato was grown organically. These days too many gardeners grow their potatoes using sprays. We eat only what we grow ourselves. I haven’t sprayed my potatoes now for five years. My wife says, Oh for God’s sake spray the potatoes this year, because she’s hanging out for a boiled spud, but no! I refuse, even though Colorado potato beetles decimate my crop every year. I really hope the little girl at the school, and the boys too, learn from my example.